Far from the beaten path for many Americans, our northern Rocky Mountains feature two popular national parks, fertile ranch land, and some of the most unspoiled and intact landscapes in North America. This so-called "Crown of the Continent" is also the largest wildlife corridor in the Lower 48 and remains undivided by highways and cities. Photographer Steven Gnam's sumptous and striking photos reveal the region in all its moods, bringing the rugged and lush landscapes, the big megafauna and small critters, the popular recreation and personal lives up close in vivid detail. His images will inspire pride in Crown residents and encourage visitors to dig deeper----to create greater public awareness for this American treasure. Complementing Gnam's remarkable images is an essay by award-winning writer Douglas Chadwick, who explores the Crown's biodiversity, from wolverines and grizzly bears to marmots and stoneflies. Chadwick's essay shows that connecting key wildlands is not only critical, but achievable through community collaboration. Michael Jamison describes recent conservation successes to preserve the way of life in the Crown, while Karsten Heuer's epilogue encourages continued work to keep the region intact. Their message is hopeful----conservation groups, local governments, and native tribes in the Crown have begun to make wildlife a priority when considering new development. The Crown of the Continent is also a rare example of international cooperation to preserve a wild landscape. In 1932, Glacier National Park and Canada's Waterton Lakes National Park were joined together as Waterton-Glacier International Peace Park and designated a UNESCO World Heritage Site. 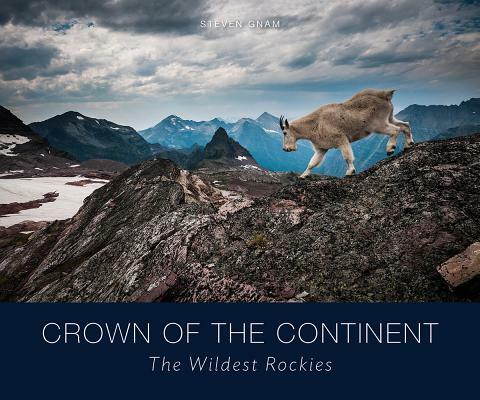 The transboundary nature of the Crown of the Continent is one of the region's greatest assets, and both the United States and Canada are represented in the photos and essays of The Wildest Rockies.